Congregation of Symsagittifera roscoffensis, photographed by Patrick Le Mao (NB. The link for this photo is the one provided by Google Images, but I'm having trouble loading the source page). The Acoela are a distinct assemblage of marine worms ranging in size from the microscopic to a little over a centimetre in length. The name 'Acoela' means 'without a cavity', and refers to the lack of a proper gut in these animals. Instead, the mouth (which is situated on the underside of the animal) leads to a central vacuole surrounded by a syncytium (a multinucleate mass that is not divided into individual cells) that takes in nutritive particles by phagocytosis (engulfment by membrane folding, like how an Amoeba feeds). 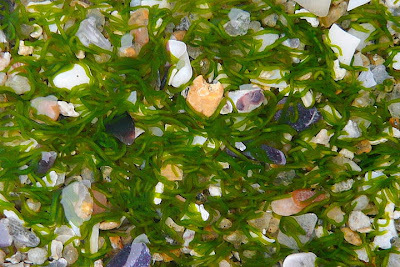 In many of the larger acoels, feeding is supplemented (or even largely superseded) by the presence of endosymbiotic algae that provide nutrients for their host worm (it is the algae that give the worms in the photo above their bright green colour). One particular family of acoels, the Solenofilomorphidae, live in anoxic sulfide sands, an environment that until the late 1960s was thought inimicable to animal life. The panther worm Hofstenia miamia, photographed by Andreas Wallberg. 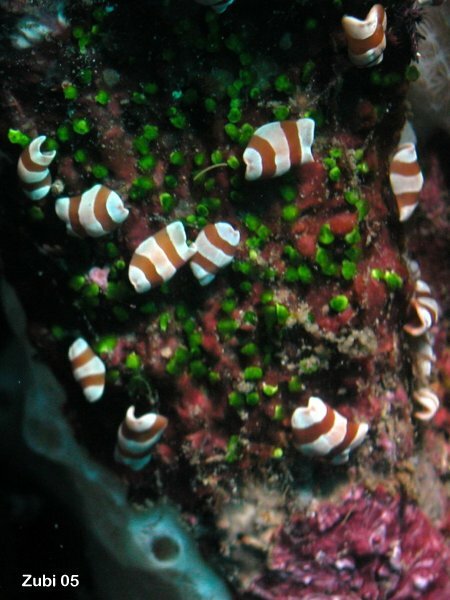 Acoels have received most attention in recent years due to debate about their relationships to other animals. 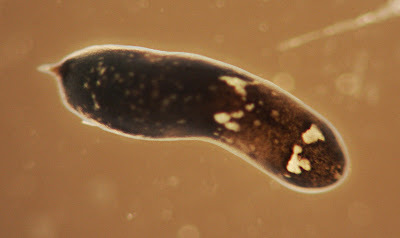 Long included among the Platyhelminthes (flatworms), recent studies have indicated that acoels are not close relatives of that group (which is now placed as a derived lineage of Lophotrochozoa). It is generally accepted that acoels are most closely related to a similar group of marine worms called Nemertodermatida, and a few recent studies have also connected them with another marine worm Xenoturbella (Philippe et al. 2011). All three groups lack a through-gut, and a relationship between them seems credible. As regards the connection between this total group and other animals (a subject that I've discussed in a previous post), there are three main options currently on the table: (1) Acoels and their relatives are the sister group (or, in some studies, successive sister groups) to all other bilaterians. This is perhaps the most popular position, and suggests that the simple morphology of acoels relative to other animals may be comparable to the ancestral morphology for bilaterians as a whole. (2) Some recent studies (e.g. Philippe et al. 2011) have recovered an alternative position for acoels within the deuterostomes, as sister to echinoderms + hemichordates. If so, the simple morphology of acoels would probably be derived from more complex ancestors. (3) Finally, there are still some studies (e.g. Dunn et al. 2008) whose results place acoels together with the Platyhelminthes among the Lophotrochozoa (generally as the sister to other Platyhelminthes). However, most current researchers seem to regard such results as due to long-branch attraction between the two groups. Specimens of an unidentified species of acoel on coral, photographed by Teresa Zubi. Within the Acoela themselves, recent studies have supported the association of larger species as a clade nested among the smaller species (Hooge & Tyler 2006). Many characters used in earlier classifications of the group, such as the presence of a pharynx or endosymbionts or the placement and numbers of genitalia*, have not always related well to recent molecular phylogenies, but other features such as the arrangement of muscles in the body wall have. One particularly notable feature has been the arrangement of microtubules in the spermatozoa, with successive reductions in the number of central microtubules (from the ancestral 9 + 2 arrangement, to 9 + 1, to 9 + 0) correlating strongly with molecular data (Hooge & Tyler 2006). *I believe I've noted it before, but for all that organisms such as microscopic worms are usually regarded as morphologically 'simple' and 'conservative', you don't find much variation among more 'complex' animals like mammals in the number of penises they have. Dunn, C. W., A. Hejnol, D. Q. Matus, K. Pang, W. E. Browne, S. A. Smith, E. Seaver, G. W. Rouse, M. Obst, G. D. Edgecombe, M. V. Sørensen, S. H. D. Haddock, A. Schmidt-Rhaesa, A. Okusu, R. M. Kristensen, W. C. Wheeler, M. Q. Martindale & G. Giribet. 2008. Broad phylogenomic sampling improves resolution of the animal tree of life. Nature 452: 745-749. Hooge, M. D., & S. Tyler. 2006. Concordance of molecular and morphological data: the example of the Acoela. Integrative and Comparative Biology 46 (2): 118-124. Philippe, H., H. Brinkmann, R. R. Copley, L. L. Moroz, H. Nakano, A. J. Poustka, A. Wallberg, K. J. Peterson & M. J. Telford. 2011. Acoelomorph flatworms are deuterostomes related to Xenoturbella. Nature 470: 255-258. See, posts like this are the reason I love this blog. I had no idea that there were such animals. In fact, I was half-tempted to post my guess on the Name That Bug post this time, but wisely held off, as it turns out I wouldn't even have landed in the right kingdom. I was interested by Adam's cry of anguish on the NTB post: "Damn, pipped again by a name change I was unaware of. Symsagittifera roscoffensis used to be Convoluta roscoffensis." All more fuel for the Linnaeus Was Dumb fire: Adam keeps losing points because of the unreasonable habit species have of changing their nomenclature just because their taxonomy changes. If they are related to Deuterostomes, could it be that, rather then being derived from more complex members of the group, Acoels and kin are actually a basal off branch? This way they aren't depicted as being some-how degenerate, but rather sharing a common ancestry with the primitive forerunners of the deuterostomes. I bring this up because I've always had a problem with acoels and platyhelminthes being looked on as somehow being reduced. It just doesn't make much sense to me. I look at both of these groups as, while not being related, as at least being basal to their respective, more complex kin. It may be difficult to accept flatworms as reduced, but the alternative is to presume that the the through-gut and other complex characters shared by protostomes and deuterostomes have been independently derived: a supposition that is equally, if not even more, difficult to accept. In the case of Platyhelminthes, whose phylogenetic position is now relatively robust, the situation is even worse: assuming that their lack of a through-gut is primitive would require convergent evolution of a through-gut in at least four lineages (deuterostomes, ecdysozoans, trochozoans and gnathiferans) and probably more depending on the positions of more difficult-to-place taxa (chaetognaths, bryozoans, gastrotrichs). And if we accept Platyhelminthes as reduced (which I think we must), then it becomes easier to credit an analogous reduction in acoelomorphs.